The NIIM Clinic provides Intra Venous (IV) and Chelation Therapy (pronounced [keelay’shun]) from a fully equipped, in-house suite located in Hawthorn, Melbourne. Chelation therapy uses specific chelating agents to bind toxins and heavy metals in the bloodstream, allowing them to be flushed out of the body in the urine, sweat and faeces. Common toxins and metals that can accumulate in the body include mercury, lead, arsenic, cadmium and aluminium. These substances can cause harmful effects; for example, accumulated calcium can be deposited in blood vessels, contributing to artery disease. Intravenous vitamin therapy involves the administration of vitamins, minerals and other nutrients, such as amino acids, directly into the bloodstream in the form of a drip. The IV method bypasses the digestive system, allowing delivery of greater quantities of nutrients and promoting maximal absorption. Orally administered vitamins can be inactivated in the digestive tract or poorly absorbed, and in high doses can cause unwanted side-effects such as abdominal cramps and nausea. Only the purest forms of vitamins and minerals are used in IV administration. Your nutrient drip is specifically formulated for your needs based on your doctor’s recommendations. 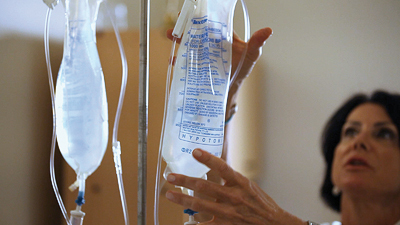 How is IV and Chelation Therapy administered? IV nutrients and chelating agents are given through an IV drip, typically into the arm, under the supervision of a registered nurse. The drip itself is generally painless, although you may feel a sting when the needle is inserted. The drip takes 1-3 hours to infuse, during which time you can relax in the comfort of the IV Clinic which provides plush recli ners, reading material, wi-fi, and refreshments. Severe side effects from IV Vitamin and Chelation Therapy are very uncommon, however you may experience mild effects such as facial flushing, thirst, mild dizziness.. Nursing staff are on hand to provide the best care to patients and offer support and advice. The cost of each drip varies depending on the type and quantity of nutritional or chelating ingredients. For specific pricing, please contact NIIM Clinic reception, after discussing infusion requirements with your doctor, on (03) 9804 0646, or by emailing clinic@niim.com.au. IV Vitamin and Chelation Therapy is not covered by Medicare, however you may be eligible for partial reimbursement from your private health fund. IV Therapy is undertaken by referral only. NIIM integrative GPs can work with you to determine if IV therapy is appropriate for your health. Outside referrals are also accepted. To make an appointment at the IV Clinic, please contact NIIM Clinic reception on (03) 9804 0646.